Elements formerly shared much of the same user interface with Photoshop, but its look has been considerably streamlined in recent years. Today, Elements doesn’t bear much more than a family resemblance. Although it’s missing a few features that Adobe deems professional, such as CMYK editing, Elements includes most of the basic image-editing tools that the typical digital photographer needs on a regular basis. 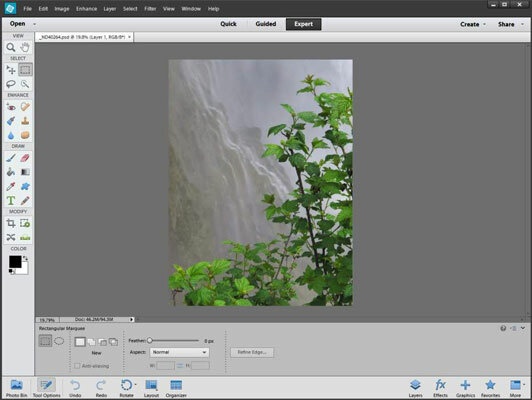 Those tools include image-selection tools, retouching tools, painting tools, a generous assortment of filters, and the capability to expand those filters by accepting the same Photoshop plug-ins that its sibling program can. A price tag of $100 (or less) puts Elements within the reach of anyone, and its reduced feature set is a good match for the needs of the typical digital photographer. You can find most of the standard selection, retouching, and painting tools from Photoshop available in Elements. If your image-editing needs revolve around retouching and manipulating individual pictures one at a time, you probably will never miss the more advanced Photoshop features. In Elements’ editing module, the latest versions boast Photomerge technology for combining photos into broad panoramas and adjustments previews that you can use to judge effects before applying them. Elements has layer masks for applying changes to just portions of layers, new filters for pop art, Lomo (plastic camera) effects, and new portrait filters. The newest version is more tightly integrated with social media sites like Facebook and has new templates for creating calendars, cards, and photo books on your home printer. The automated commands on the Enhance menu make quick work of common image-editing tasks, such as adjusting backlighting or color cast. As a result, an occasional user working with Elements can complete those tasks faster and more accurately than a seasoned graphics pro working with Photoshop. Elements also makes a good introduction to Photoshop for people who plan to upgrade someday. After you master Elements, you can transfer much of what you know directly to Photoshop. You use filters, most kinds of selections, and basic tonal and color corrections in much the same way in both applications. Compared to the most basic non-Adobe image editors, Elements can be a bit daunting. Elements today is as complex as Photoshop was five or ten years ago, although Adobe has added Quick, Guided, and Expert modes that can help new users make the transition. The similarity to Photoshop in Expert mode works against you if you’re a total image-editing neophyte. That’s because, even with the revamped user interface, the menus and palettes still bear more similarity to Photoshop than they do to less ambitious programs. Even so, dSLR photographers probably wouldn’t be happy with the simplest image editors, anyway, so the “easy, but not that easy” interface of Elements doesn’t offer much of a downside. The most vexing downside has been eliminated. In years past, Adobe’s tendency was to introduce new features for Elements in its Windows version first, with the Macintosh upgrade following months later. Some features are available only in the Windows edition. In recent versions, Adobe has introduced new editions for both platforms simultaneously.